It’s the first day of a new year. 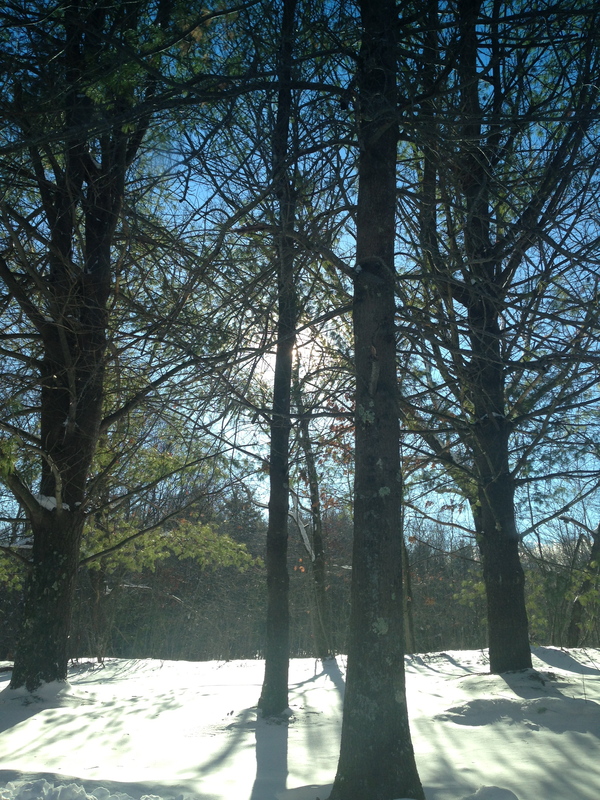 Where I live, the sky is clear and blue, temperatures in the high 20’s (Fahrenheit). It’s a beautiful day. And so it begins. In the last few days, on many of the lists and groups I frequent, I have started witnessing an infamous yearly ritual practiced by parents of young children. Yes, you guessed it: question after question about where to go to play in the winter. It is January, and at least here in the Northeast US, we’re already well into the months-long practice of fretting about infants, toddlers and preschoolers “getting bored” having to spend so much time inside, inevitably followed by requests for advice about how to deal with challenging behavior. It seemed time for a blog post. Or a pitch. Or, apparently, both. I will admit, upon witnessing the steady pace of these messages, falling like the leaves from the trees in October, I feel sad. Sad at the misinformation that parents receive (and cling to.) Sad at the fears–so m any of them dramatically overblown or unnecessary–that drive so many of our choices. Sad for all the kiddos that will not experience all of the joy of rain, snow, cold, and wind this year. Sad for all the moms and dads and caregivers that will be stuck inside with kids who are whining and bouncing off the walls from cabin fever. Nature. It’s a wonderful thing. And so incredibly good for our children. Sure, it won’t be the most comfortable thing for you. You really have to bundle up, so start getting together your warm clothes now so that you’ll be prepared. And remember…no grousing when you come home cold and wet and you have to change your clothes. It’s all in the fun of it. (Hot chocolate, anyone?) This is parenting. It’s the big leagues. We have to do all kinds of things that are yucky and uncomfortable and not our first choice. It comes with the territory. Dress in layers. Yeah, I know that this is all folly to those of you in Arizona or sunny (or even rainy) California (although ironically, a friend in L.A. just posted a photo of her kids at a parade in 31F degree temperatures, the same temperature as it is today here in Boston–and the same temperature that a parent told me was too cold for going out the other day–so I guess you never know.) If that’s you, you can probably move on–this post doesn’t really apply to you. Or maybe it does, if you keep your kids in when the weather turns “bad”, whatever “bad” is wherever you are. Or maybe you have a relative that might benefit from some further examination of this subject, in which case feel free to share. Of course, I understand that there are climates (Minnesota and North Dakota and Alaska are some that come most immediately to mind, but I’m sure there are others) where it is simply unsafe to take children outside on some days. 30 below with a wind chill? Yeah, I’m with you. Keep ’em inside. Zero degrees? Yeah. Time to crank up that stove and do a baking activity. But face it, that’s not what most of us are dealing with. Most of the posts that I read, for example, come from the area in and around Boston, Massachusetts, a place where it rarely gets below 20 degrees in the winter, where ice storms are few and far between. So I’m asking you–most of you anyway–to take another look. Here’s how I see it. None of us are perfect, we parents. We make decisions and set limits for all kinds of things, and I’ve never met a parent yet for whom some of those limits or decisions aren’t sometimes arbitrary. Here’s my rule: We don’t have to be perfect–but at the very least, we can endeavor to be honest about the decisions we make about our children. If you don’t want to be cold, if you hate being outside in the winter or in the rain, that’s legitimate. If you are terrified that your kids are going to get sick if they’re outside in the cold and you’re going to have to take sick days at work, okay. If you just don’t like all of the struggle to get kids in and out of rain or snowsuits or the water or mud tracked inside your home or the stares of people that seem to say that you’re crazy, jumping around in the rain with your kids, I hear you. But then, please, just say that. Say that these are your fears. Say that it’s about your comfort. Say that you can’t tolerate mess in your house. Own it. It’s okay. But I ask you, please do not say that your kids can’t go outside because of the weather. Because they not only can, it’s great for them (and for you, but that’s not my business.) Of course, there are potential concerns, but those just call for preparation and forethought (and proper clothing! ), not avoidance. It’s all I ever ask of the families that I work with: Honesty and decision-making based on facts. That’s it. Know the facts about illness. Know the facts about benefits of nature and cold and exploratory, messy play, and what they do for your kids. Know about the benefits that children gain from unstructured free play. 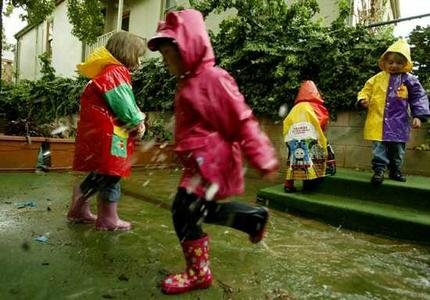 Know about the countries and cultures (and some schools in the U.S.) that have their children outside every day, in all sorts of weather, and how it works out. Know a bit about the growing knowledge base about “nature deficits” in our children. Know your own limits and how much they might be subject to modification in the best interest of your children. In the interest of helping some of that along, here we go. On the sickness front, there is disagreement, to be sure. I mean, I think we all agree (or I hope so anyway) that sickness doesn’t come from cold, but from exposure to viruses. But yes, we can also probably agree that being cold for too long or being too damp can lower resistance, so that a child (or adult) can be more susceptible to that next virus that they are inevitably exposed to in line at the grocery store, child care, playgroup, or at the indoor playspace (where germs are actually far more easily transmitted than outdoors, something to keep in mind.) Last year, I recall that several of my friends circulated around some research that was wildly flinging itself around facebook about cold and its relationship to illness. I also recall that when I read the studies, they were primarily discussing the risks of hypothermia upon extensive exposure to extreme cold–including one study that focused exclusively on hospitalized children who were artificially chilled for medical purposes…now does that really apply to you? The negative results described in these studies represent an extreme that I assume can be avoided with a bit of common sense (and an understanding and careful reading of research!). All day in freezing rain with inadequate rain protection? No. Of course not. An hour and half with boots and a rain suit? Sure. Apples and oranges. How well-developed are your respectful limit setting strategies? Because, you know, those come in handy in a lot more situations than hats and gloves and cold weather. If you need support with those skills, there are many good sources for advice and coaching. There are ways to set limits around wearing hats and gloves that work! Have you tried taking a deep breath and backing off? Tuck some mittens and hat in your pocket or bag. Let them try it without. They’ll get cold. When they complain (which they will), you offer the hats and mittens. Sometimes fully natural consequences work much better for young ones because they feel more of a sense of control. Have you tried letting them choose a hat and mittens that they like? Some children are very sensitive to the restrictions of gloves..mittens sometimes work better. Warm socks on their hands will work in a pinch. Adult mittens are sometimes better because they’re roomier and less restrictive. How about one of those newfangled scarves with handpockets in the ends? Or try a hood instead of a hat, sometimes they’re more amenable to that. Does it matter as much as you think it does? For young infants, they ideally shouldn’t spend a lot of time outside in temps lower than 20F/-6C degrees fahrenheit–but then again, for young infants, you can bundle them up at will. For older children (even toddlers and preschoolers) most guidelines say the shouldn’t spend much time outside in temps of 0F/-17C (including wind chill). If it’s 25F/-4C or 35F/2C out, they won’t get frostbite. Yes, their hands will get cold. If they do, they’ll speak up, I promise. They’ll be ok.
Do you need a new mantra? Get up every morning, look yourself in the eyes in the mirror after you brush your teeth, and say: “There’s no such thing as bad weather, only inappropriate clothing.” It works. This is one of those great opportunities for proactive parenting. This is one of those times when you can take action that will prevent challenging behavior before it begins. Young children need to move. Young children need to explore. Young children need to get outside–yes, active indoor play is great, too, but there is no substitute for fresh air. Young children need to get out all that energy that they store in their bodies, the energy that, when “squashed”, channels itself into knocking furniture over while wrestling in the house on a cold winter day or hitting their siblings. Snow? Yup. Rain. Yup. Cold. Yup. It does them good. People all over the world take their kids out every day in weather probably much colder than yours. All things are relative. They (and you) get used to it. You can do it. I want to tell you a couple of brief stories. I love stories. The first concerns the title of this post. If you grew up in the baby boomer generation (or maybe even if you didn’t), your parents may have said this to you. “You’re not sugar, you won’t melt.” It’s what I heard every time a whine about the rain began to emanate. It wasn’t said in meanness or in sarcasm, just with a smile and a matter-of-factness that reinforced the truth of the message. Go outside. Get wet. It won’t hurt y ou. As a result of hearing that message repeatedly throughout my toddler and preschool years, I spent nearly every rainy day of my early childhood years in boots and raincoat taking the little plastic tugboats that I played with in the tub, running to the end of the block, putting them into the rushing gutters of rain, and running alongside them to the other end of the block, plucking them out of their torrential rivers to save them from the deadly whirlpool of the storm drain. Running back to the “high” end of the block (it wasn’t really a hill) and doing it again. And again. Until I got tired. Or until my friends (who all wanted to join me in this activity) had to go home. I can see it in my mind’s eye like it was yesterday. Freedom. Experimentation. Laughter. Physics (!) Memories. The other story I want to share is not my own, but comes from the genius of Bev Bos, early childhood educator extraordinaire. Her books are marvelous, especially her first book, entitled “Don’t Move the Muffin Tins.”As an educator, she is the best ambassador of playfulness that I have ever met, and that alone qualifies her for sainthood in my book. (If you want to learn more about her–though it will never match seeing her in person and being instantly transported to age three–you can see a pretty good interview with her here) One of the many times that I have met and worked with her, she told a story (she is, among other things, a vibrant storyteller) that has stuck with me for more than 25 years. 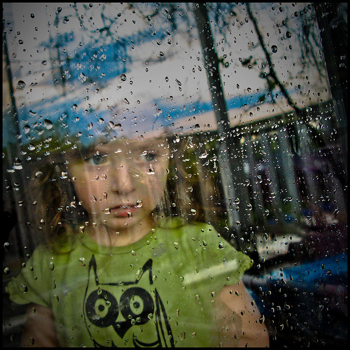 She told of a time, in her preschool classroom in Roseville, California, when it was pouring outside. Usually, when it was raining that hard, they stayed inside. But this one day (as I recall the story), the kids were “bouncing off the walls,” and clearly needed some sort of energy outlet. She made the decision to take them all outside. They ran around in the pouring rain, screaming, and getting soaked to the bone–even the ones who didn’t have boots and raincoats. They all came back inside and changed into warm clothes and told stories and drew pictures of their adventures in the rain. Sure, that’s a great story. But that’s not really the important part. The important part was what she shared about what happened in the years following. As a beloved teacher–like any beloved teacher–she has many children who come back to visit as they grow. First graders. Fifth graders. High school students. And in her case, even as the “next generation”–one-time students who are now parents of children attending her preschool. She shared that the one thing she has heard more often than anything over the years, the children who have visited most frequently, and the thing that, when it is said, brings excited light and life into the teller’s eyes, regardless of their age is just this: “Miss Bev, remember that time we ran in the rain?” “Yes, I do,” she says. They all remember. Of course. As I see it, this is our job. To make memories that will last for a lifetime, and that will bring excited life and light and life to our children’s eyes as they recollect them, even as adults. As the parent of a child who is now a teen, I can vouch for the fact that they remember all of their early experiences, and throughout their lives, they relate them in the same spirit in which they were originally experienced. Let’s make ’em joyful and playful ones. 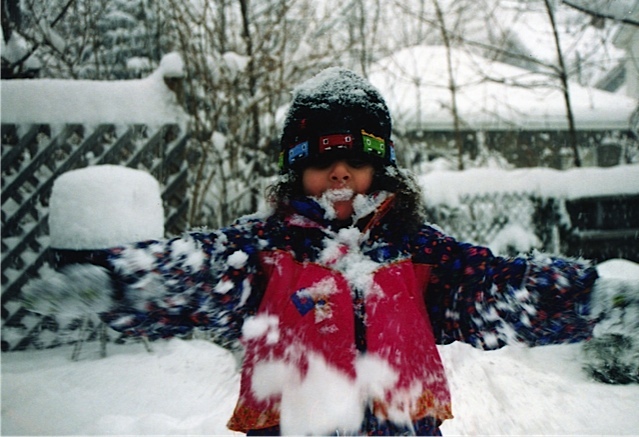 This entry was posted in infants, parenting, play, preschoolers, toddlers, weather and tagged activity, cold, parenting, play, preschoolers, rain, recess, snow, toddlers, weather, winter. Bookmark the permalink.